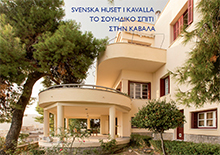 The Swedish House in Kavala was originally built as a staff residence for the employees of the Swedish Tobacco Monopoly in 1936. Kavala was at that time a hub for the handling of oriental tobacco, which was exported from the Northern port city all over the world. The Swedish monopoly was then only one of the foreign companies keeping offices and residences there. After the 2nd World War the demand for oriental tobacco decreased and thus also the need for the Swedish company to keep and maintain a house in Kavala. The building was eventually donated to the Swedish Institute at Athens in 1976, and has ever since functioned as a non-profit guest house for Swedish writers, artists and photographers, as well as for scholars in need of a quiet, yet inspiring work environment. The house operates yearly from the 1st of March to the 31st of November. It has ten guest rooms with altogether 15 beds. The Swedish House together with its garden is a protected building as it is a very early example of the Bauhaus style in Greece. It was drawn by the Greek architect Panagiotis Manouilidis who was inspired by contemporaneous architecture styles in Western Europe. The furniture, much of it still in place, was imported from Sweden. Far away from Sweden, the house therefore constitutes a rare example of intact Swedish interior design from the 1930s.